With barely time to sweep up the remains of Tanabata, Kyoto has jumped into preparations for one of the largest oldest and most treasured festivals in Japan–Gion Matsuri! On side streets and main streets throughout downtown Kyoto, construction has begun on the 32 massive floats that will comprise the Gion Matsuri parade. Matsuri actually just means “festival”, and Gion is a goryo-e, or protective festival meant to fend off medieval plagues and epidemics 1200 years ago, but it soon grew into a way for craft guilds and merchant families to compete in showing off their wealth and taste. Music, dance, comic plays, and artistic treasures had all become part of the celebrations by the close of the 10th century, creating a true feast for the senses. And in order to parade their accomplishments through the city, each group constructed huge wheeled carts decorated as sumptuously as their means and skills allowed. That tradition along with all of the accumulated artifacts have been carefully preserved and handed down so that once a year, each year these beautiful relics of the past can be brought out and reconstructed for the continuing celebration of Gion Matsuri. Over these last few days since July tenth, the various groups have swarmed with activity in the sweltering July heat to begin putting these floats together. Although the floats can be several stories high, no nails are used in the construction. 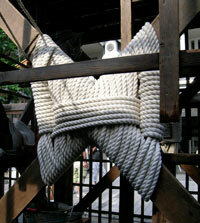 The enormous beams are simply lashed together with ropes as shown below. And at right, you can see the skeletal structures beginning to take form. Small streets are entirely blocked off, while major streets become restricted to a single lane that allows traffic to slowly crawl around the float during these festival days. And of course we Kyotoites take a keen interest in the progress of the construction. As the floats grow, so does the festival atmosphere. Sight-seeing increases with each day as does the number of vendors selling cold drinks and a variety of souvenirs. 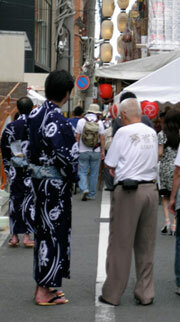 Members of the “team” involved with each float can be recognized in the crowd because of their distinct summer kimono. At this particular float, the team members sport an indigo blue with a white carp design. Within a building near each float, the float committee displays the fabulous artifacts that will eventually be used to decorate the completed float. From the late 16th century onwards, as a result of the growing prosperity of Kyoto’s merchants, artwork from China, Persia, and even Europe were transmitted eastward along the Silk Road until they found their way to the capital of Japan. Many of the floats are decorated with Gobelin tapestries that are thought to have come from Holland in the early 17th century. I have been told that these remain the best preserved Gobelin tapestries in the world with European scholars frequently seeking a chance to examine them. 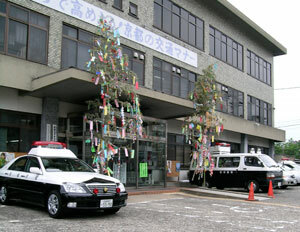 Below is a photo of the “treasury” of the Koiyama (Carp Float) Preservation Society. Note the large carved wooden carp on the left of the photo. This carp, placed on top of the float, is the obvious source of the float’s name. Behind the carp is a section of Gobelin tapestry. The orange torii gate in the center of the picture, the candles on the altar and the folded paper streamers on the right are symbols of the purification ritual that preceded the beginning of construction for this year’s festival. Preparations will continue for another several days, and then the grand parade itself takes place on July 17th. This entry was posted in holidays, Kyoto living on July 14, 2008 by admin. It’s hot and humid and typically summer in Kyoto. The mountains that surround the city hold in a stagnant cloud of heat that settles over everything. Children and families and friends try to cool off by wading in the the Kamogawa river that runs down the east side of the city. Those who can try to excape the summer’s heat with foreign travel and since many of my friends are English teachers and college professors, I’ve had a week of good-byes as I see them off on their travels. They’ll be back in September when school starts up and the weather begins to cool. 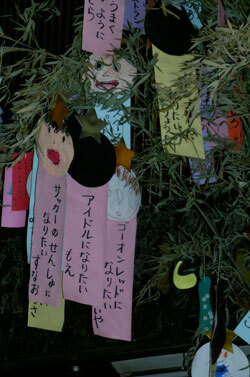 For those of us who stay, summer holds a series of holidays beginning with Tanabata, the Star Festival. Occuring on July 7th, it is one of the five double-fortune days: January 1st (01/01) is the solar new year, February 2nd (02/02) is the lunar new year, March 3rd (03/03) is girls’ day, May 5th (05/05) boys’ day and July 7th (07/07) is Tanabata. Tanabata celebrates two stars that appear to meet in the mid-summer night sky, although they normally remain quite distant through most of the year. According to mythological tradition, these stars represent Ori-hime (the weaving princess) and Hiko-boshi (the farmer), archetypes of skills needed by society. Through most of the year they busy themselves with their work, but take a summer break from their labors to enjoy each other’s company, then return refreshed and renewed, and re-doubled in their skills. To celebrate this holiday, Japanese adorn bamboo branches with colorful paper streamers and make wishes for acquiring or improving some personal skill. Traditionally, boys wish to improve their farming skills, while girls wish for better sewing skills, making it one of my favorite holidays all year. For about a week before the 7th, there are bamboo branches set up throughout the city. The photo above was taken at my local shopping arcade and the wishes were probably written by local school children, who appear to have adorned their streamers with self-portraits. As for me, I celebrated Tanabata with another Kyoto tradition – Tea ceremony. Tea was served in Koko-an, the tea room on the top floor of the Hosomi Museum. The lovely okashi sweets were served by Nishimura-san, while the elegant tea preparations were performed by Sakano-san. As always the case with Tea, the preparations and utensils reflect and rejoice in the present moment. 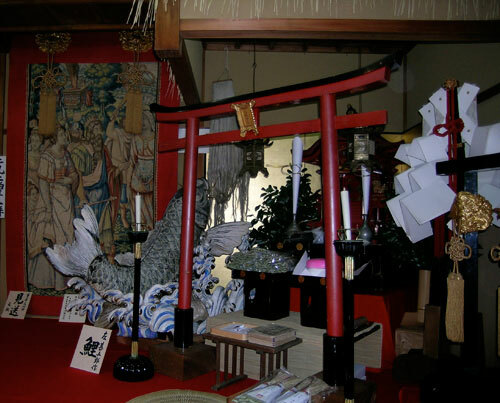 The utensils were carried into the room in a chabako, typical of the season and the bowl in which tea was served is decorated with bamboo fronds and Tanabata streamers. It was a beautiful way to enjoy a summer’s afternoon. This entry was posted in holidays, Kyoto living on July 12, 2008 by admin. Among the many blessings of my life in Kyoto, my friendship with Judith Clancy, author of Exploring Kyoto is definitely quite high on the list. Aside from the pleasure of her company, her enthusiasm for life and all that it offers has given her a knowledge base that she willingly and readily shares. No matter what I’ve wanted to do, who I’ve wanted to meet or where I’ve wanted to go, Judith always knows the best and most enjoyable way to get there, who I should see and when would be the best time to go. 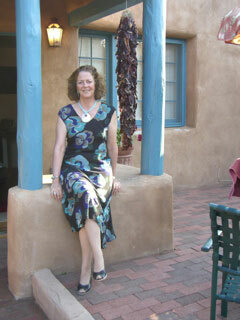 Having lived in Kyoto since 1970, Judith eagerly embraced the culture, studying a wide range of Japanese arts. 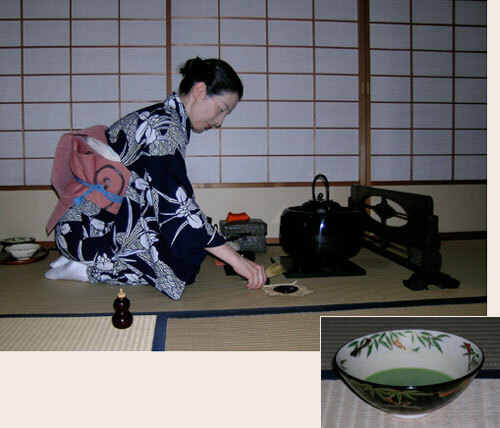 And over the years, she’s become certified in Tea ceremony and well-practiced in the art of ikebana as well as interpretor for a number of international culture groups and translator for several books on Japanese textiles. All of this knowledge and love for Japanese culture and the city of Kyoto has been distilled into a wonderful Kyoto City guidebook called Exploring Kyoto — on foot in the ancient capital. With the recent release of it’s third printing, the book has been newly revised and updated throughout. Exploring Kyoto will not only provide its readers with a walking guide through Kyoto’s streets and neighborhoods but also guide the reader through the exotic history of one of Asia’s most ancient cities. A quick peek at the reviews on Amazon will show you that it’s also the guide that even we Kyoto residents buy and use. As an avid traveler herself, Judith can truly appreciate the finer points of tourism — those little details that make traveling a joy instead of a hassle — and she brings that perspective to bear in operating Kyoto Workshops, her own Kyoto-based tour business. Always mindful of the varying needs and interests of her clients, she has successfully arranged personalized tours for a wide range of tastes — Chinese dignitaries, martial arts enthusiasts, and art conoisseurs to name a few. 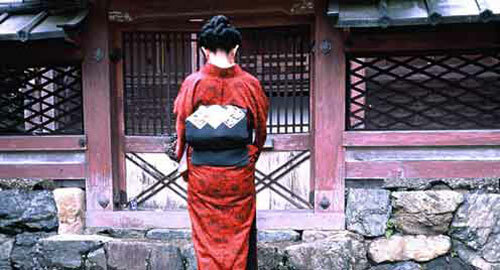 When not busy guiding private tours or writing her next book on Kyoto restaurants, Judith makes herself at home in an old Nishijin weaver’s studio that she remodeled into a beautiful home nestled in a tiny back alley near Myorenji Temple. Preserving the high beamed ceilings of the weaving studio but installing heated flooring to protect against the cold damp of Kyoto winters, she has turned her home into a perfect backdrop not only for her fabulous art collection but also her exquisite flower arrangements, both of which she changes constantly to reflect the season in perfect Kyoto style. This entry was posted in Kyoto living on July 1, 2008 by admin.